You know you need to fix errors and optimize your site for better traffic. The first stage in growth begins with understanding that includes a website assessment. Understanding the historical value of your efforts, the online opportunities that exist, and the barriers that are currently holding you back from achieving your goals including getting new website visitors. 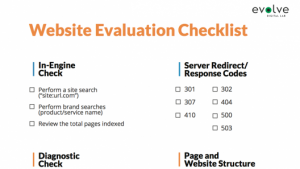 Download the free Website Evaluation Checklist to understand part of the process in improving your website for search engines as well as your potential customers.